Study objectives: There are contradictory perspectives on the importance of conventional coronary heart disease (CHD) risk factors in explaining population levels and social gradients in CHD. This study examined the contribution of conventional CHD risk factors (smoking, hypertension, dyslipidaemia, and diabetes) to explaining population levels and to absolute and relative social inequalities in CHD. This was investigated in an entire population and by creating a low risk sub-population with no smoking, dyslipidaemia, diabetes, and hypertension to simulate what would happen to relative and social inequalities in CHD if conventional risk factors were removed. Design, setting, and participants: Population based study of 2682 eastern Finnish men aged 42, 48, 54, 60 at baseline with 10.5 years average follow up of fatal (ICD9 codes 410–414) and non-fatal (MONICA criteria) CHD events. Main results: In the whole population, 94.6% of events occurred among men exposed to at least one conventional risk factor, with a PAR of 68%. Adjustment for conventional risk factors reduced relative social inequality by 24%. However, in a low risk population free from conventional risk factors, absolute social inequality reduced by 72%. Conclusions: Conventional risk factors explain the majority of absolute social inequality in CHD because conventional risk factors explain the vast majority of CHD cases in the population. However, the role of conventional risk factors in explaining relative social inequality was modest. This apparent paradox may arise in populations where inequalities in conventional risk factors between social groups are low, relative to the high levels of conventional risk factors within every social group. If the concern is to reduce the overall population health burden of CHD and the disproportionate population health burden associated with the social inequalities in CHD, then reducing conventional risk factors will do the job. There are two apparently contradictory epidemiological perspectives—one concerning the causes of social inequalities in coronary heart disease (CHD) and another concerning the causes of population levels of CHD. In social epidemiology it is has been established that conventional risk factors—smoking, hypertension, and cholesterol (and by extension the behaviours that influence hypertension and cholesterol such as diet, alcohol consumption, and physical activity)—do not explain social inequalities in CHD. Studies explored this issue from the late 1950s,1,2 and by 1981 Rose and Marmot concluded that most social inequality in CHD “remains unexplained”(page 13).3 Exact quantification of how much social inequality in CHD is explained by statistical adjustment for conventional risk factors varies but estimates typically range from 15% to 40%. Such numbers will probably underestimate the role of conventional risk factors because of measurement error, the absence of data regarding conventional risk factors across the lifecourse, and incomplete modelling of their interactions. Nevertheless, the idea that conventional risk factors do not explain social inequalities in CHD has been so widely accepted,4,5,6,7,8,9,10 even by the current authors,11,12 that over the past 20 years it has become a core concept in understanding the causes of social inequalities in CHD and health inequalities more generally. So how do the risk factors that account for most cases of CHD in a population apparently not account for social gradients in CHD, when social inequalities simply emerge from sub-grouping the population according to some indicator of social position? Our objective in this study is to use prospective data from a large well characterised cohort to illustrate how this apparent paradox may arise. We will show that conventional risk factors do account for most cases of CHD but that they do not explain the relative social gradient in CHD. We will then show how this situation arises because of the epidemiological preference for contrasting and explaining risk on a relative rather than absolute scale. We use prospective data on 2682 Finnish men in the Kuopio ischaemic heart disease risk factor study (KIHD).28,29 Baseline examinations were conducted from 1984 to 1989, with ascertainment of events through 1998. Our measure of social inequality was based on education, where we created three groups (primary school or less; some high school; completed high school or better).30 We stratified the population into lower and higher risk groups31 based on smoking (current compared with others) hypertension (> 140/90 mm Hg or medications), dyslipidaemia (low density lipoprotein >160 mmol/l) consistent with National Cholesterol Education Project (NCEP)/Adult Treatment Panel III (ATPIII) guidelines,32 and prevalent diabetes (fasting glucose ⩾6.1 mmol/l or diabetes drugs). Information on biological and behavioural risk factors was collected by standard procedures and has been described elsewhere.29 The outcome used here combines fatal (ICD9 codes 410–414) and non-fatal CHD, classified according to MONICA criteria.33 We calculated the PAR associated with exposure to at least one risk factor and calculated absolute and relative risks associated with the educational inequalities in the whole KIHD population and a low risk segment of the population free from smoking, hypertension, dyslipidaemia, and diabetes. We used proportional hazard models to calculate the crude and adjusted relative educational inequalities in CHD. Hopelessness, defined as negative expectancies about oneself and the future, was measured by two questionnaire items that asked about the likelihood of reaching goals and the possibility of positive change in the future.34 The study received ethical approval from the University of Michigan Institutional Review Board. In table 1, we show the typical sort of analysis done in social epidemiology. Comparing those with less than a primary education with those with more than high school, the crude relative risk (RR) for CHD was 1.90 (95% CI:1.38 to 2.61). After control for conventional risk factors—smoking, hypertension, dyslipidaemia, and diabetes—the RR was 1.68 (95% CI:1.22 to 2.33)—a reduction in the excess RR of 24%. The crude social inequality adjusted for a psychosocial risk factor (hopelessness) was 1.65 (1.19 to 2.29)—a reduction in the excess RR of 28%. Based on these analyses, on one hand, we would conclude that most cases of CHD in this population can be attributed to conventional risk factors—consistent with observations from CHD epidemiology. On the other hand, adjustment for conventional risk factors explained only a modest proportion of the relative social inequality in CHD—consistent with observations from social epidemiology. To illustrate what would happen to the social inequality and levels of CHD, if conventional risk factors were removed from the population, we excluded all men exposed to at least one conventional risk factor (84.9% of the sample and 94.6% of the cases) to create a low risk population.31 Table 2 shows the calculations of risk and both absolute and relative social inequalities in CHD in the whole population and in the low risk population (that is, not currently smoking, without hypertension, dyslipidaemia, or diabetes). If conventional risk factors were removed from the whole population, CHD risk would reduce by 64% from 158 to 57 per 1000. Among the least educated, risk would reduce by 66% from 194 to 66 per 1000. 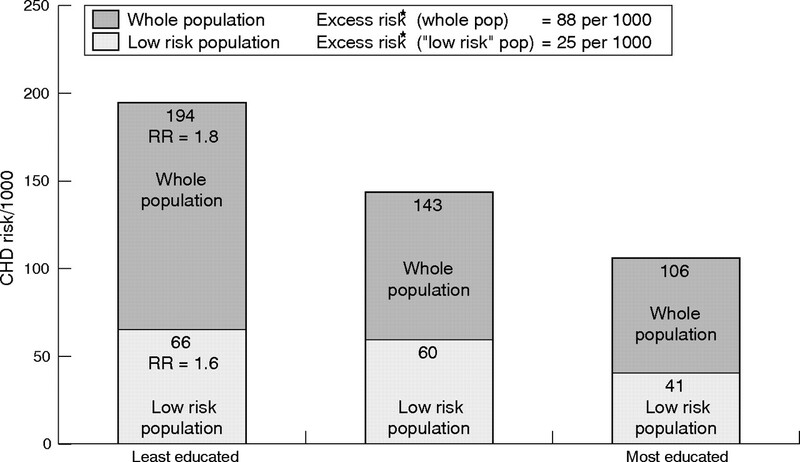 While a relative social inequality (RR = 1.61) would still remain in the low risk population, the absolute social inequality in CHD—as shown by change in the excess risk—would reduce by 72% from 88 to 25 per 1000 (fig 1). Relative and excess risks associated with social inequality in CHD in the whole KIHD population and a low risk subset of that population. *Excess and relative risk compares least with most educated. Our intention in this paper was to show that explanations for social inequalities in CHD can depend on whether one is interested in explaining relative or absolute social inequalities. Certainly this approach needs to be examined in other populations. In this Finnish cohort, conventional risk factors account for the vast majority of CHD cases and for a substantial portion of absolute social inequalities in CHD. In a low risk population free from conventional risk factors, the excess risk among the least educated is 72% lower. This 72% reduction in excess risk is probably conservative, given our crude definition of a low risk population. On this point, table 3 shows that in the low risk population, there were no differences in overweight or blood pressure but the least educated men were more likely to be former smokers, have higher total cholesterol and low density lipoprotein (LDL), lower levels of vigorous physical activity and cardiorespiratory fitness, and were 4.5 cm shorter than better educated men. This suggests that there remain residual differences associated with known risk factors that are not captured by our clinically defined categorisation of low risk36 but that nevertheless may contribute to both overall levels and social inequalities in CHD risk in this segment of the population. Thus, it is probable that at least some of the residual absolute social inequality in CHD (excess risk = 25/1000) in the low risk population is also partly attributable to increased levels of conventional risk factors that did not meet out clinical cut-points. However, it may also be the case that the residual social inequality in CHD that persists in a population with no conventional CHD risk factors is attributable to the direct effects of other novel mechanisms such as stress, job control, etc, that do not work through conventional risk factors. There are plausible hypotheses concerning direct psycho-neuro-endocrine mediation37 of social inequality that may bypass conventional risk factor mechanisms. Nevertheless, in this population such non-conventional CHD mechanisms account for a small number of cases compared with those accounted for by conventional risk factor mechanisms. This should not be taken to mean that psychosocial processes are unimportant to CHD.38 When psychosocial processes influence behaviours and/or conventional risk factors they are extremely important antecedent causes of conventional risk factors. However, if psychosocial processes are hypothesised to not operate through conventional risk factors, then their contribution to population levels and absolute social inequalities in CHD may be small, but they may contribute importantly to relative CHD inequality. A further limitation is that the illustration of overall and social inequality in CHD in the low risk segment of the population is admittedly based on small numbers as shown by the wide confidence intervals reported in table 2. However, this is unavoidable and results from the fact that the prevalence of conventional risk factors is high and the number of cases attributable to having at least one risk factor is high (94.6% of all cases). Our population is not overly extreme in this regard. Similarly small proportions of individuals with no conventional risk factors have been noted in other studies,25 and should be expected in populations where chronic CHD is a major cause of death. When investigating relative social inequalities in CHD, the apparent paradox may arise that the factors that explain most cases of CHD do not seem to explain relative social inequalities in CHD. In our example, we showed that adjustment for conventional risk factors only reduced the relative educational inequalities in CHD by 24%. While this is an underestimate, such results are normally interpreted to mean that most of the effects of social inequality on CHD do not work through mechanisms linked to conventional risk factors,14 and so other potential causes of relative social inequalities need to be investigated. If we pursue this line of reasoning in these data, adjustment of the relative educational inequalities for a single identified psychosocial risk factor, such as hopelessness,34 reduces the relative educational inequality by 28%, compared with the reduction of 24% achieved by adjusting for four conventional risk factors. If we ignore that this effect of hopelessness on CHD is partly confounded by conventional risk factors, these results would normally be interpreted to mean that hopelessness is at least as important a mechanism for explaining the relative inequality as conventional risk factors. However, if we could intervene and remove all hopelessness from this population we would eliminate 14% of CHD cases, compared with over 90% of cases eliminated through removing smoking, hypertension, dyslipidaemia, and diabetes. The extent to which a third variable reduces the RR in an exposure-outcome association (sometimes taken as an indication of confounding of the association) depends on the relative distributions of the exposure over strata of the third variable and the strength of its association with the outcome. In this case there is a more extreme relative distribution of education over strata of hopelessness than over strata of the conventional risk factors (partly because the prevalence of conventional risk factors is high in this population), and so hopelessness seems to be a stronger confounder (in this case interpreted as a mechanism) of the association between education and CHD. Explaining the mechanisms behind relative social inequalities in CHD is a legitimate and important focus of research because it may lead to an understanding of novel and reversible CHD risk factors that will reduce social inequality in CHD. Nevertheless, explanations for relative social inequalities need to be understood within the context of what causes the population health burden of CHD—that is, what causes most cases of CHD. In populations where the prevalence of conventional risk factors is high, it is possible that there are small or even no differences in their prevalence across social groups such that they cannot account for relative CHD differences across social groups but contribute substantially to the absolute risk of CHD within all social groups.31 For instance, the Whitehall II study has reported no social inequality in perhaps the primary CHD risk factor—cholesterol.45 We have shown here that removing conventional risk factors from the population may have little effect on relative social inequalities but a large effect on absolute social inequalities as indicated by a reduction in the excess risk. Importantly, this also means that whatever proximal and distal factors may be proposed as causes of relative social inequalities in CHD, if their behavioural and biological mechanisms do not involve conventional risk factors then they probably account for a small proportion of CHD cases. Conventional risk factors seem not to explain social inequalities in CHD. Therefore, there must be other risk factors that generate the social gradient in CHD. This idea has become a powerful influence on how people understand social inequalities in CHD and what should be done to reduce them. Understanding the causes of social inequalities in CHD may depend on whether one is interested in explaining absolute or relative inequalities in CHD. Conventional risk factors account for the vast majority of CHD cases and for a substantial portion of absolute social inequalities in CHD—72% of the excess risk. An absolute risk approach to understand social inequalities in CHD focuses attention on those risk factors that cause most cases of disease attributable to social inequality. If the concern is to reduce the overall population health burden of CHD and the disproportionate population health burden associated with the social inequalities in CHD, then reducing conventional risk factors will do the job. People make behavioural choices but they do so within layers of social context.12 Simply admonishing people for their bad habits is at worst victim blaming, at best naive. Health behaviours are influenced over the lifecourse35,52 at multiple levels by the material, psychosocial, cultural, and family conditions in which people live.53 The development and maintenance of smoking, diet, and exercise habits that influence levels of conventional CHD risk factors cannot be construed simply as the result of individual choice because choice is shaped by the physical, cultural, and social environments in which people live and work. A combination of population wide shifts in the distribution of risk factors and individual change strategies for those at high risk, in both early and later life is required. Ultimately this will mean engaging the political and economic forces that have interests in maintaining profits from the sale of products and services that influence conventional CHD risk factors. The effectiveness of planned interventions to change levels of conventional risk factors and health behaviours has proved to be limited. Nevertheless, reducing levels of these risk factors will reduce the population health burden of social inequalities in CHD because it will reduce absolute risk in all social groups. We should increase our efforts to find ways to influence the multiple pathways from international, national, and local policy through to individual behaviour and treatment that will reduce conventional risk factors among current and future generations in richer and poorer countries. The findings of this study in no way alleviate the need to better understand and ameliorate the uneven distribution of conventional CHD risk factors across social groups.12 However, using an absolute risk approach to understand social inequalities in CHD focuses attention on those risk factors that cause most cases of disease attributable to social inequality.54–56 So if the concern is to reduce the overall population health burden of CHD and the disproportionate population health burden associated with the social inequalities in CHD, then reducing conventional risk factors will do the job. We should increase efforts to find ways to influence the multiple pathways from international, national, and local policy46,57,58 through to individual behaviour that will reduce conventional risk factors among current and future generations in richer and poorer countries. We thank George A Kaplan and Jukka T Salonen for access to the KIHD study data and George Kaplan and Hal Morgenstern for comments on an initial draft. All authors contributed to the analysis, interpretation, and writing of the manuscript. Pell S, D’Alonzo CA. Blood pressure, body weight, serum cholesterol, and smoking habits among executives and nonexecutives. J Occup Med1961;3:467–70. Holme I, Hjermann I, Helgeland A, et al. Coronary risk factors and socioeconomic status: the Oslo study. Lancet 1976;308:1396–8. Rose G, Marmot MG. Social class and coronary heart disease. Br Heart J1981;45:13–19. Marmot MG, Shipley MJ, Rose G. Inequalities in death—specific explanations of a general pattern? Journal Short Form workform1984;1:1003–6. Kaplan GA, Keil JE. Socioeconomic factors and cardiovascular disease—a review of the literature. Circulation1993;88:1973–98. Adler NE, Boyce WT, Chesney MA, et al. Socioeconomic inequalities in health. No easy solution. JAMA 1993;269:3140–5. Evans RG, Barer ML, Marmor TR. Why are some people healthy and others not?. New York: Aldine de Gruyter, 1994. Macintyre S. The Black Report and beyond: what are the issues? Soc Sci Med1997;44:723–45. Syme SL, Balfour JL. Explaining inequalities in coronary heart disease. Lancet1997;350:231–2. House JS, Williams DR. Understanding and reducing socioeconomic and racial/ethnic disparities in health. In: Smedley B, Syme SL, eds. Promoting health: intervention strategies from social and behavioral research. Washington, DC: National Academy Press, 2001:81–124. Davey Smith G, Shipley MJ, Rose G. The magnitude and causes of socioeconomic differentials in mortality: further evidence from the Whitehall study. J Epidemiol Community Health1990;44:265–70. Lynch JW, Kaplan GA, Salonen JT. Why do poor people behave poorly? Variation in adult health behaviours and psychosocial characteristics by stages of the socioeconomic lifecourse. Soc Sci Med1997;44:809–19. Adler NE, Marmot M, McEwen BS, et al.Socioeconomic status and health in industrial nations. New York: New York Academy of Sciences, 1999. Marmot MG. Status syndrome. New York: Times Books, 2004. Lantz PM, House JS, Lepkowski JM, et al. Socioeconomic factors, health behaviors, and mortality: results from a nationally representative prospective study of US adults. JAMA 1998;279:1703–8. Raphael D. Barriers to addressing the societal determinants of health: public health units and poverty in Ontario, Canada. Health Promotion International2003;18:397–405. Smedley B, Syme SL. Promoting health: intervention strategies from social and behavioral research. Washington, DC: National Academy Press, 2001. Stamler J. Established major risk factors. In: Marmot M, Elliot P, eds. Coronary heart disease epidemiology. Oxford: Oxford University Press, 1992:35–66. Yusuf S, Reddy S, Ounpuu S, et al. Global burden of cardiovascular diseases: part 2: variations in cardiovascular disease by specific ethnic groups and geographic regions and prevention strategies. Circulation 2001;104:2855–64. Yusuf S, Reddy S, Ounpuu S, et al. Global burden of cardiovascular diseases: part 1: general considerations, the epidemiologic transition, risk factors, and impact of urbanization. Circulation 2001;104:2746–53. Magnus P, Beaglehole R. The real contribution of the major risk factors to the coronary epidemics-time to end the ‘only-50%’ myth. Arch Intern Med 2001;161:2657–60. Beaglehole R, Magnus P. The search for new risk factors for coronary heart disease: occupational therapy for epidemiologists? Int J Epidemiol2002;31:1117–22. Yusuf S, Hawken S, Ounpuu S, et al. Effect of potentially modifiable risk factors associated with myocardial infarction in 52 countries (the INTERHEART study): case-control study. Lancet 2004;364:937–52. Whincup P, Emberson J, Morris R, et al. INTERHEART. Lancet 2005;365:117. Stamler J, Stamler R, Neaton JD, et al. Low risk-factor profile and long-term cardiovascular and noncardiovascular mortality and life expectancy. Findings for 5 large cohorts of young adult and middle-aged men and women. JAMA 1999;282:2012–18. Greenland P, Knoll MD, Stamler J, et al. Major risk factors as antecedents of fatal and nonfatal coronary heart disease events. JAMA 2003;290:891–7. Leon DA, Chenet L, Shkolnikov VM, et al. Huge variation in Russian mortality rates 1984–94: artefact, alcohol, or what? Lancet 1997;350:383–8. Salonen JT. Is there a continuing need for longitudinal epidemiologic research? The Kuopio ischaemic heart disease risk factor study. Ann Clin Res1988;20:46–50. Lynch JW, Kaplan GA, Cohen RD, et al. Do cardiovascular risk factors explain the relation between socioeconomic status, risk of all-cause mortality, cardiovascular mortality, and acute myocardial infarction? Am J Epidemiol 1996;144:934–42. Lynch J, Kaplan GA, Salonen R, et al. Socioeconomic status and carotid atherosclerosis. Circulation 1995;92:1786–92. Stamler J, Neaton JD, Garside DB, et al. Current status: six established risk major factors—and low risk. In: Marmot M, Elliott P, eds. Coronary heart disease epidemiology. Vol 2. London: Oxford University Press, 2004:32–70. Cleeman JI, Grundy SM, Becker D, et al. Executive summary of the third report of the National Cholesterol Education Program (NCEP) Expert Panel on Detection, Evaluation, and Treatment of High Blood Cholesterol in Adults (Adult Treatment Panel Iii). JAMA 2001;285:2486–97. Tunstall-Pedoe H, Kuulasmaa K, Amouyel P, et al. Myocardial infarction and coronary deaths in the World Health Organization MONICA project—registration procedures, event rates, and case-fatality rates in 38 populations from 21 countries in 4 continents. Circulation 1994;90:583–612. Everson SA, Goldberg DE, Kaplan GA, et al. Hopelessness and risk of mortality and incidence of myocardial infarction and cancer. Psychosom Med 1996;58:113–21. Davey Smith G, Lynch J. Life course influences on coronary heart disease. In: Marmot M, Elliot P, eds. Coronary heart disease epidemiology. 2nd ed. London: Oxford University Press, 2005:568–90. Jackson R, Lawes CMM, Bennett DA, et al. Treatment with drugs to lower blood pressure and blood cholesterol based on an individual’s absolute cardiovascular risk. Lancet 2005;365:434. McEwen BS. Protective and damaging effects of stress mediators. N Engl J Med1998;338:171–9. Lynch JW, Davey Smith G, Kaplan GA, et al. Income inequality and mortality: importance to health of individual income, psychosocial environment, or material conditions. BMJ 2000;320:1200–4. Rockhill B, Newman B, Weinberg C. Use and misuse of population attributable fractions. Am J Public Health1998;88:15–19. Victora CG, Vaughan JP, Barros FC, et al. Explaining trends in inequities: evidence from Brazilian child health studies. Lancet 2000;356:1093–8. Rose G. Sick individuals and sick populations. Int J Epidemiol1985;14:32–8. Davey Smith G, Egger M. Who benefits from medical interventions? BMJ1994;308:72–4. Vågerö D, Erikson R. Socioeconomic inequalities in morbidity and mortality in western Europe. Lancet1997;350:516. Rose G. The strategy of preventive medicine. Oxford: Oxford University Press, 1992. Marmot MG, Bosma H, Hemingway H, et al. Contribution of job control and other risk factors to social variations in coronary heart disease incidence. Lancet 1997;350:235–9. Ebrahim S, Davey Smith G. Exporting failure? Coronary heart disease and stroke in developing countries. Int J Epidemiol2001;30:201–5. Evans A, Tolonen H, Hense H-W, et al. Trends in coronary risk factors in the WHO MONICA Project. Int J Epidemiol 2001;30:35S–40. Fiore MC, Novotny TE, Pierce JP, et al. Trends in cigarette smoking in the United States. The changing influence of gender and race. JAMA 1989;261:49–55. Cooper R, Cutler J, Desvigne-Nickens P, et al. Trends and disparities in coronary heart disease, stroke, and other cardiovascular diseases in the United States: findings of the national conference on cardiovascular disease prevention. Circulation 2000;102:3137–47. Unal B, Critchley JA, Capewell S. Modelling the decline in coronary heart disease deaths in England and Wales, 1981–2000: comparing contributions from primary prevention and secondary prevention. BMJ2005;331:614–19. Laatikainen T, Critchley J, Vartiainen E, et al. Explaining the decline in coronary heart disease mortality in Finland between 1982 and 1997. Am J Epidemiol 2005;162:764–73. Lynch J, Davey Smith G. A life course approach to chronic disease epidemiology. Annu Rev Public Health2005;26:1–35. Graham H. Gender and class as dimensions of smoking-behavior in Britain—insights from a survey of mothers. Soc Sci Med1994;38:691–8. Emberson JR, Whincup PH, Morris RW, et al. Social class differences in coronary heart disease in middle-aged British men: implications for prevention. Int J Epidemiol 2004;33:289–96. Marmot M. Risk factors or social causes? Int J Epidemiol2004;33:297–8. Emberson JR, Whincup PH, Morris RW, et al. Reducing social inequalities and the prevention of coronary heart disease. Int J Epidemiol 2004;33:1152–3. Beaglehole R, Bonita R, Horton R, et al. Public health in the new era: improving health through collective action. Lancet 2004;363:2084–6. Faergeman O. Coronary artery disease. Genes, drugs and the agricultural connection. Amsterdam: Elsevier, 2003. Funding: JL and GDS were supported in part by the Robert Wood Johnson Foundation, Investigator Awards in Health Policy Research Program. The ideas expressed here are the authors and do not represent the Robert Wood Johnson Foundation. JL and KB were supported by grant 5P50 NDO3898605 from the National Institute of Child Health and Development. JL was additionally supported by grant HL44199 from the National Heart, Lung, and Blood Institute. SH was supported by a contract from the National Cancer Institute (263-MQ-314803). None of these funding agencies had any role in the conception, design, analysis, or writing of the manuscript. Journal of Epidemiology & Community Health 2006; 60 373-373 Published Online First: 13 Apr 2006.